23 March – His Excellency the Governor, Mr. Martyn Roper, accompanied by the Minister of Environment, the Hon. Dwayne Seymour, Deputy Governor, the Hon. Franz Manderson and West Bay MLA and Ministerial Councilor Capt. 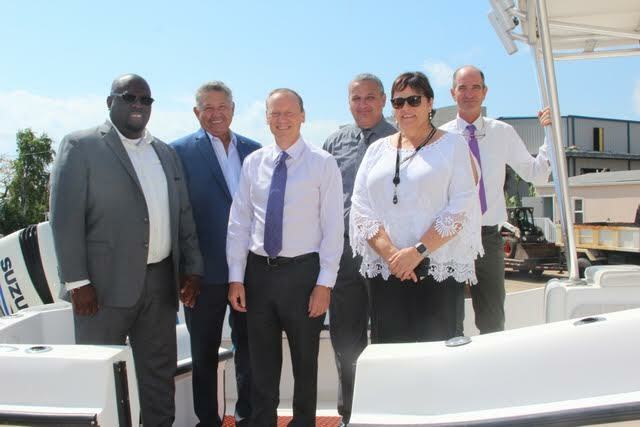 Eugene Ebanks toured the Cayman Islands Government’s Department of Environment (DoE) headquarters on the morning of Friday, 22nd March, spending nearly two hours learning about the agency and meeting dozens of staff members. 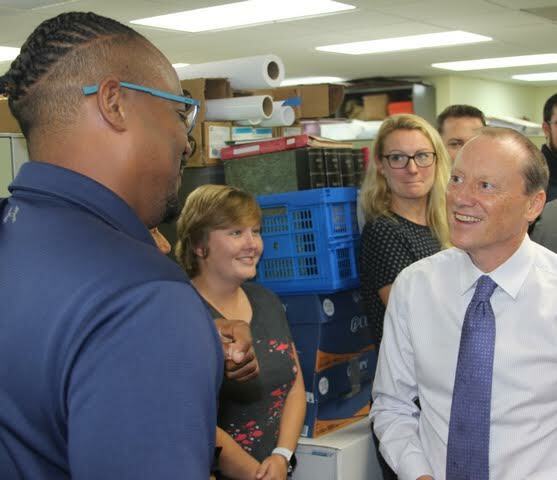 The tour was Governor Roper’s first visit to the DoE since arriving in Cayman. Mr. Roper was also accompanied during the tour by Ministry Chief Officer Jennifer Ahearn. Following a tour of the facility on North Sound Road, senior staff members, led by DoE Director Gina Ebanks-Petrie, each got an opportunity to discuss the duties of their respective units within the department. Everything from marine and terrestrial conservation, to indigenous species protection, to environmental management and enforcement under the National Conservation Law was discussed. “We were glad to have this opportunity to let Mr. Roper know a bit more about the work we do every day and very pleased at his supportive response,” Ms. Ebanks-Petrie said. Minister Seymour also expressed a keen interest in a number of projects under way at the DoE, including efforts to implement turtle-friendly property and street lighting and ongoing enforcement of marine and terrestrial conservation rules.